Repsol Honda’s Marc Marquez claimed his ninth pole position of the season at Brno in an entertaining qualifying session in which the top eleven riders were covered by just half a second in Qualifying Practice 2. Marquez’s best lap time of 1’55.585 was just 0.058 seconds shy of the Circuit Best Lap record and was enough to see him grab pole position ahead of a pair of Ducati riders that claimed a front row start for tomorrow’s race. Ducati Team’s Andrea Dovizioso was second quickest in qualifying after clocking a time of 1’55.714 to finish just 0.012 seconds ahead of Pramac Racing’s Andrea Iannone who was third quickest in QP2. Both Dovizioso and Iannone set their personal best times using the combination of the medium compound front and soft compound rear slicks, while Marquez used the medium compound front and rear slicks on the way to pole position. Weather conditions today were similar to yesterday with cool ambient temperatures and occasional rain falling throughout the day. The rain didn’t affect any of the MotoGP sessions and the track temperature reached a maximum of 36°C – 5° warmer than yesterday’s peak reading. With yesterday’s Free Practice 2 session a washout, the riders used today to hone their setup on their preferred tyre combination and perform race simulations in the afternoon FP4 session. The cool temperatures resulted in the majority of riders preferring to use their softer rear slick option; medium compound for the Factory Honda and Yamaha riders, soft compound for the Ducati and Open-class riders for both long runs in practice and to set a quick lap in qualifying. The majority of riders opted for the medium compound front slick today due to its balance of braking and cornering performance, with other riders preferring the better warm-up performance and edge grip of the soft compound front. “I’m happy about the pole position today. I had Iannone behind me so the only solution was to push, because I had to set a hot lap. 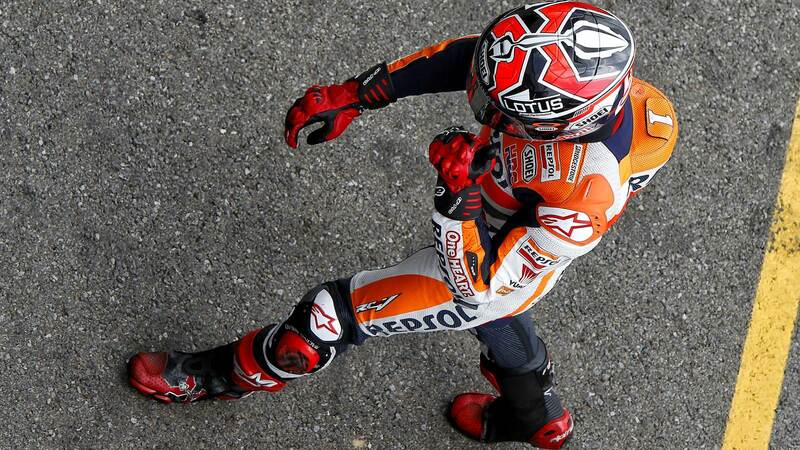 As for tomorrow’s race, we have pole but the toughest rivals will start from the second row, especially Dani. We will see what condition Valentino is in and hopefully he can ride well, because he has also been strong this weekend and I hope Jorge can be in the fight too. I’m expecting a tough battle from start to finish for the win”. “Today was positive as it didn’t rain and we were able to try out tyres in the dry. We are pretty clear now about which direction we will go for the race. It was a pity that we couldn’t get a spot on the front row in qualifying, but it was difficult because the times were extremely close. I hope I can make a good start tomorrow and have a good race”. “I am really very happy that I was able to access the Q2 after the first qualifying session. It’s very important for me to stay close to the top riders to take advantage of the opportunity and learn more and more. Tomorrow I want to be able to get into the points and if possible to finish in the top ten. “Today I crashed in FP4, just before the Qualifying 1 session: when I started to brake, I lost the front end immediately. I don’t know if there was something strange on the track surface, but I saw that Rossi crashed in front of me in the same way. Luckily I haven’t sustained big injuries. Before the crash we tried a different chassis geometry on my first bike, which helped me to get more rear grip, but then after the crash I had to make the Qualifying 1 with the second bike, with the old set-up, so I couldn’t improve a lot my lap times. The qualifying was not good, but with the new set-up we have been a little bit more competitive during FP4, so I’m confident ahead of tomorrow’s race: we will try to make a good start and then to keep our pace, that is not too bad”. “Today was difficult, because I don’t have a good feeling with the bike; I’m struggling with edge grip and also rear traction, so it was quite difficult for me to feel comfortable. I also had a crash in FP4 , therefore I didn’t have a great feeling going into qualifying; we still did not a bad job, anyway, but I need to be more consistent for the race tomorrow. We need to find something which can give me more feeling under braking and corner entry and also to find more rear grip”.